Posted by cath in Info and Cooks Notes, ingredients, Recipes, variations, vegetables. 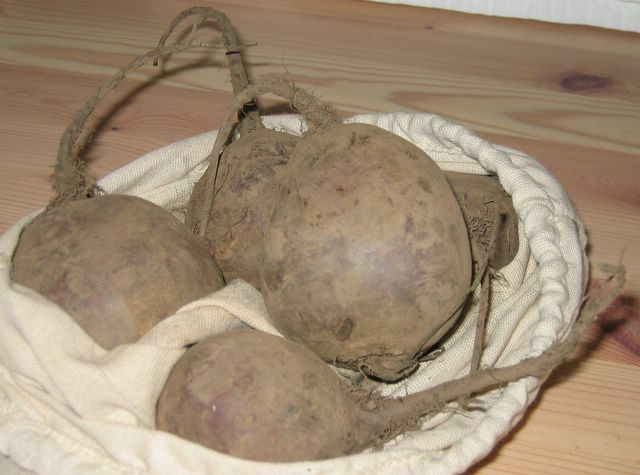 I’ve been buying fresh beetroots from the market for a while now. But just what to do with them? – I wasn’t too sure except for cold cooked beetroot in salads and Austrailian-influenced sarnies. Well, good news! At the weekend, peeled, chunky pieces of beetroot were added to an experimental venison stew. I had no particular recipe for the stew, but starting with good stewing principles and lovely fresh ingredients it’s pretty easy to make something that tastes good. (I recommend the The River Cottage Meat Book by Hugh Fearnley-Whittingstall for in-depth discussions about stewing). Anyhow, I’m pleased to say that 2-3 hours later the stew plus beetroot was a great sucess – particularly the beetroot addition. Perfectly cooked, quite stewy tasting in the first bite, but really beetrooty towards the middle – an amazing find and something I’ll be doing again – particularly with dark meats in rich porter, ale or wine based stews. One to remember! 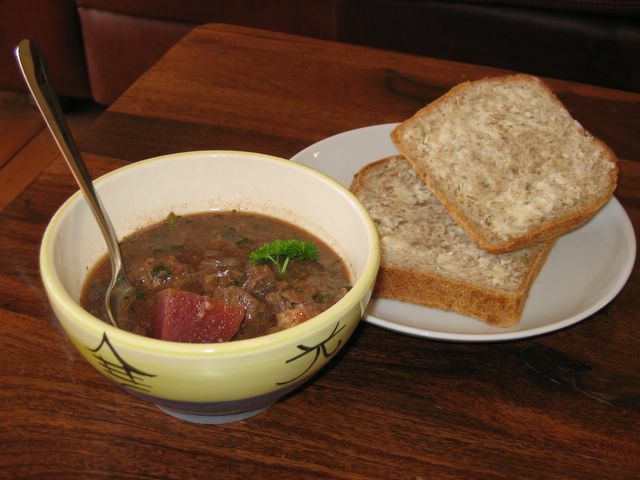 Venison Stew with Beetroot served with homemade crusty bread. Beetroot in stew was not the first experiment actually, roasting beetroot was the first real break from tradition for me. Again, roast beetroot was a real surprise, very tasty, and so easy to do! Just peel and chunk, then coat in (hot) goose fat (oil for veggies) and cooked in a hot oven for 1-2 hours, turning once or twice (depends how big you’ve cut them and how well done you want your beets). No picture of roasted beetroot – I was too slow and they were all gobbled up! Note: you will get very purple hands washing, peeling and handling fresh beetroot. Don’t worry – it doesn’t last long!